In rock ‘n’ roll music there’s few words that have as much ability to define an artist as the word “excitement”. From the very beginning the music itself was the living embodiment of the word, and with Roy Brown shouting to the heavens about throwing a party in hell the response was euphoric. The floodgates opened as an entire generation of ambitious singers and musicians embraced the possibilities rock ‘n’ roll offered. In the coming months and years there’d be more and more artists elbowing their way to the table, but while rock had plenty of room for everybody willing to shed their musical inhibitions and get down and boogie without fear of reprisal, it reserved its honored seats for those who would do so while stirring the listeners the most passionately. Goree Carter has been one of the more assertive in that regard as he’s wielded his otherworldly electric guitar in an effort to take excitement in rock to a whole new level. In spite of his undeniable skills it wasn’t shaping up to be the easiest thing to do, largely because that instrument was largely still kept under wraps in almost all styles of music. Hearing Carter assault the strings like a man possessed until the sound coming out of their speakers was distorted in a gnarled twisted fury might’ve been too powerful for audiences to fully comprehend in 1949. As much as rock music has made its name over the years by breaking new ground the advancements that tend to have the most initial success are ones which have some gradual acclimation period… sort of easing listeners into the future rather than hurtling them through a time warp. But those hearing Carter’s scintillating fret work on Rock Awhile back in the spring wouldn’t have known WHAT to make of it the first time around. Hair-raising? Yes. Overpowering? Absolutely. Well, that depends. If your definition of exciting is “fearing for your life”, then sure, exciting it was. But for others it might just have been terrifying. Today of course, having been immersed in the sounds of Carter’s spiritual descendents on the electric guitar over the next seven decades it seems entirely relatable to us, but that’s why context is always the most important aspect of any historical evaluation. The fact is in the context of 1949 what Goree Carter was in the process of establishing marked a sea-change in how that instrument was utilized and how rock music would capitalize on it to take the excitement it generated to a different plateau. We weren’t quite there yet however and so Carter is going to have to see if simply more exposure over time will suffice in terms of finding acceptance for it, or whether he’ll have to modify his approach to try and win over an apprehensive and reluctant fan base. With Hoy Hoy he takes another shot at doing so in an uncompromised and totally unrelenting manner. There’s a saying about going to the well too often that might be applicable here, but not so much in the sense of listeners getting tired of the same basic structural approach, I mean how could they get tired of it if not many had heard it? But in the big picture scheme of things that lesson might apply simply because each time out that he tried a full-bore attack he was competing with the ghost of Rock Awhile, a record which – for both its larger theme and its sheer audacity – probably could not be beaten. Even if the audience themselves weren’t aware of the first record with which to compare the latest sides with, that didn’t meant that there wasn’t still a personal bar to be met with each new release. Theoretically if he never topped his initial groundbreaking effort what would it take to get noticed? Hoy Hoy takes a slightly different angle to try and capture your immediate attention. Rather than launch right into the guitar pyrotechnics, or start off with a slightly nasal bellow as he did the following time out on I’ll Send You, here Carter defers to the horns which kick this off with a catchy descending riff that leads into a call and response with his guitar. It’s almost as if he’s anticipating their uneasiness if he unleashes this modernized weapon too quickly and so by grounding it in the vestiges of the past, where it was horns who took on the role of party-starter and had the reputation of the most rousing instrument in a band’s arsenal then he’d be able to dupe them into listening once he made his presence known. But even when he does appear in that retort to the horns he keeps his sole line very succinct, three note bursts used more as accent piece than the primary draw, at least until you’ve gotten used to the sound enough for him to cut loose a bit more. That takes awhile however, as instead of launching into a fire-breathing display of his prowess he instead keeps his guitar out of sight entirely for most of the first full minute, choosing instead to let his vocals further add to the growing excitement to get you even more situated for his eventually unveiling the instrument that his reputation was built upon. Though Carter’s vocals are, as stated, somewhat nasal in texture, they’re also genuinely exuberent and much more melodic than others who’ve had the misfortune of singing through their nostrils like say Joe Swift who made it his calling card. Carter sings with a self-assurance that is contagious, barreling through the lyrics without much regard for life or limb for the most part but effectively shifting gears at the tail end of the stanzas in order not to careen into the next line and send the whole song tumbling. What he’s singing isn’t as important as how he’s singing it, something the storyline makes abundantly clear. Hoy Hoy is presumably about a recent break up as he complains about his girl mistreating him when they were together and warning her that bad luck will be her constant companion as a result of her actions. But he hardly sounds all that broken up about it, unless you take his clogged nostrils to be evidence that he was recently crying. That would be a mistake of course, for he was doing no such thing as he proves by his unyeilding rambunctiousness throughout this discourse. He may be bad mouthing her, even insisting he’s “going away to stay” by the end, but I’ll lay two to one odds he’s just blowing off steam and will be back on her doorstep by the next evening. How do we know this? Because he’s clearly taking steps to distance the song – and more importantly himself – from the approach which would match those sorrowful sentiments with the proper musical trappings. That would be the blues in case you were wondering. Considering the region in which he grew up, the affinity he had for T-Bone Walker, the desire of Freedom Records themselves to have him adopt a Walker-esque persona himself so as to more easily market him, and the fact that he certainly has the equipment on hand to do just that if he so desired, Carter steers clear of any association with the blues by never letting up on his vocal assault. There’s no greiving shown here, no downhearted lament to be wrung out of his soul or a moment where he’s too distraught to go on and so he turns to his guitar to reveal the depth of his pain. Nope, not at all. The fervor Goree Carter displays throughout shows us that he has it in his mind to do one thing and one thing only. He’s going to rock. If you weren’t aware of his reputation leading up to this record, if someone had turned you onto his work without disclosing his greatest attribute, or if you just took a chance and desposited the nickel that was burning a hole in your pocket into the flashy jukebox and randomly chose a title that seemed interesting, then based on the first 55 seconds you wouldn’t have been expecting what was to follow. For that’s when Carter immodestly sheds his comparatively restrained demeanor and like most 18 year old kids boasting of an elite talent in some facet of their behavior he sets out to impress you and lives up to the hype. The other instruments – the loose knit studio group The Hep Cats with Lonnie Lyons on piano and Conrad Johnson and Sam Williams on sax – have been more than holding their own throughout the prolonged lead in to this explosion, but now they can only take a back seat as Carter starts tossing musical hand grenades with alarming precision. Each run is expertly played, perfectly timed and exquisitely judged. He somehow comes across as being reckless in his intent, yet completely under control in his actions, his playing is quick and decisive, sharp and astonishingly fierce, yet he has the ability, and more crucially the willingness, to pull back for effect, drawing out the lines with a judicious eye for detail. When Williams (presumably) takes over on tenor sax he maintains a similar intensity and power as Carter first shadows him, almost as if he’s just making sure he too won’t let up, then when that’s assured he steps aside and lets the horn have the spotlight to himself. He doesn’t let him down, playing with an insistent drive that is nearly as captivating as what preceded it. But of course this being the Hep Cats we’re nowhere near done. They may have been technically enlisted as a backing band to a vocalist, but they took a back seat to nobody, at least not willingly, and now it’s Lyons turn to strut his stuff on the keys. Though we haven’t had too many piano solos in rock thus far to have established a widely accepted precedent Lyons isn’t shy about stating his own credentials to do so himself. No skrinking violet is Lonnie as he maintains a rock solid left while juicing up the right hand flourishes to keep the the spell established by the others from being broken. Regardless of what the song is actually about you’re caught up in the flow, shimmying across the floor and unconcerned with the romantic turmoil Carter professes to be enduring as he leads this wayward group into the musical netherworld, beckoning you to join them. When you dissect the individual parts for Hoy Hoy you’ll have no trouble spotting the pieces that don’t fit… or shouldn’t fit rather. The downcast mood he sings about is in direct conflict with the uptempo enthusiasm of his vocals and the unbridled vitality of the musicians, himself prominent among them. That shouldn’t work and to be honest it doesn’t work, not in the usual sense. If you’re focused on the lyrics and insist on their authenticity you might not be buying this performance as anything more than a immensely talented, but untutored amateur who has yet to learn the nuances of delivery. You might lump him in with the likes of Jimmy Liggins, another talented visionary at his best who also played guitar and sang with a nasal voice who failed to grasp the different moods he needed to project in order to properly convey the story at hand. But if you did that you’d making a mistake. I’ll admit the specific criticism in this case would fit, but the message you’d be sending would get lost in translation. Goree Carter knows WHAT to do, he just intentionally is choosing not to do it because it would conflict with what he NEEDS to do, which is show you the future… one you admittedly may not be ready for… as he cuts loose with his guitar. Though the fact that he had to disguise his true intent with some misdirection tactics means this can’t hope to equal his best work to date back when he was far moire unambiguous about what it was he was attempting to do, but honestly if you’re hung up on the schism between the words and the sounds you probably should stick to reading the words and muting the music anyway. Though the lyrics are always going to be a vital component of rock and when done well they’ll be indespensible in the enjoyment of the records they adorn, the fact remains that the excitement of rock ‘n’ roll is in how they present it and here Goree Carter is presenting it with more than enough fireworks to make his point. 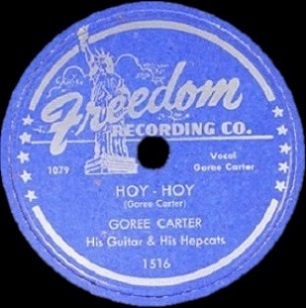 Leave a reply on "Goree Carter: “Hoy Hoy”"